Everyone enjoys holiday treats. Here are a couple of The Garage Plan Shop’s favorite chocolate treats. They are quick and easy to make. 2. Arrange pretzels in a single layer on a cookie sheet lined with parchment paper. 3. Place 1 rolo on top of each pretzel. 4. Bake for 4-5 minutes or until rolo candies begin to melt. 5. Remove from oven. 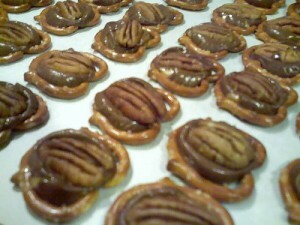 While candy is still warm press 1 pecan half into each candy. 6. Cool and serve at room temperature. Store in an airtight container. 2. Melt butter and chocolate chips in sauce pan over low heat stirring until silky smooth. 5. Stir in flour and walnuts. Mix well. 6. Spoon onto foil-lined cookie sheet. 8. Cool on pan for 5 minutes before removing. 9. Store at room temperature in airtight container. Cookies will be soft and chewy. Be sure to check back next week for a few more of our favorite holiday recipes.